With me being an over 55-year-old golfer I feel I am very equipped in offering my personal Golf Tips for Seniors, it has helped my game and I am sure my suggestions will help your game too. Firstly I want to start off with keeping your head still as much as humanly possible throughout your golf swing. During my time out on the golf course I see so many older golfers swinging the golf club and swaying with it at the same time, I can fully understand that as we have all got older the body doesn’t move like it used to, but regardless of age, ability or size we should all be able to keep our head still and just create a nice easy golf swing. Keeping your eye on the ball and keeping your head still will inevitably lead to better-struck golf shots regardless of your handicap and age! So my first and most important tip for my fellow senior golfers is to keep your ‘head still and your eye on the ball’, when I feel that my game is heading for the doghouse my main thought or mindset is to keep my head still, it works for me and I am 100% sure it will work for you too. My next tip is to really slow down your backswing for golf tips for seniors, I have said this before and I will say it again “You do not hit the golf ball in your backswing”, so you need to always focus on a nice easy takeaway and release the club at the top of the backswing for maximum power when you hit the ball. Taking the club back fast and then trying to counteract that upward motion with a downward motion takes a lot of skill and can create a lot of moving parts, this is exactly what we don’t want to happen in your backswing. This does take a time to change, especially if you have been playing golf for many years. So I would recommend getting on the driving range, hit a few shots to warm up, use your old backswing speed just to get warmed up and getting your timing right as per normal, then once warmed up start taking the club back slower at a time until you feel comfortable with your new backswing speed. My last tip for this post is about putting, if we are playing a par 72 golf course that means 18 greens, so that means on a good day that’s 2 putts per hole so that equates to 36 putts per round, that’s 50% of your golf shots straight away, I know we are not all scratch golfers but that is an extremely lot of golf shots per round regardless of your handicap! These little tips about putting will definitely give you more confidence on the green and inevitably lead to better scores. 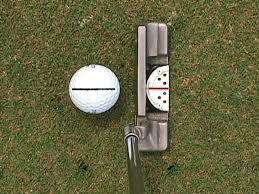 My tip is to get a felt tip permanent marker pen and draw a line on the ball when you are happy that you have picked out the line of your putt then line up the line on your ball on the line of the putt. Now that you have lined up your putt, you need to now line up your putter behind the ball square to the line on your golf ball with the line on your putter. Now you can be confident that you are in line with the ball, putter and the line towards the hole, now it is just about getting the feel of the speed of the green and rolling that putt confidently towards the hole – give it a go – I am confident this drill will help you putt more consistently during your round, but I would advise practising this on the practice putting green before going out on the golf course – to get your set up drilled well tuned. We are never too old or too young to learn different things about golf, so my next post will be about the address and taking back of the golf club in the section basic golf swing lessons. However in the meantime, if you have any comments or would like to subscribe to my newsletter please enter your details or leave a comment and I will be in touch. I better start out saying I’m not a golfer, but I enjoyed your site. The only golfing I have done is the miniature golf, which I really liked and had lots of fun. I’ve also done some archery golf, but that’s another sport. Hi Michael, Great site Michael, very clear and easy to navigate around. Being a lifetime senior golfer all the content I can very easily relate to. Every point to me is accurate with all tips and advice from beginners to seniors. The current videos are clear with basic advice on grip and more advanced shots. all of the content here is relevant as I can relate to it very easily. The content relates to all issues in golf with tips from beginners to seniors. The videos he just introduced are most helpful including proper grip and more advanced types of shots. I’m Very impressed. This looks like a professional site by all means. You have covered all the bases. I like how easy it is to read and navigate. I especially like the newsletter pop when I hovered over a page. Newsletters are something a lot of people like to get. I was immediately taken by the first impression I got when I first opened the site. Very well done. You should be proud of yourself. Wow, really nice site! Presented in a way that is understandable and readable. I really enjoyed the videos, very informative and good quality. My Uncle LOVES golfing, I’ll be sure to let him know about this page! Be sure to keep adding new stuff, I like the energy of your posts!